Out the blue one day a few weeks ago, a video popped up on Facebook that caught my eye. Not cute puppies or kitties, but roasted potatoes. And they looked well … wicked good. The video came from Serious Eats. 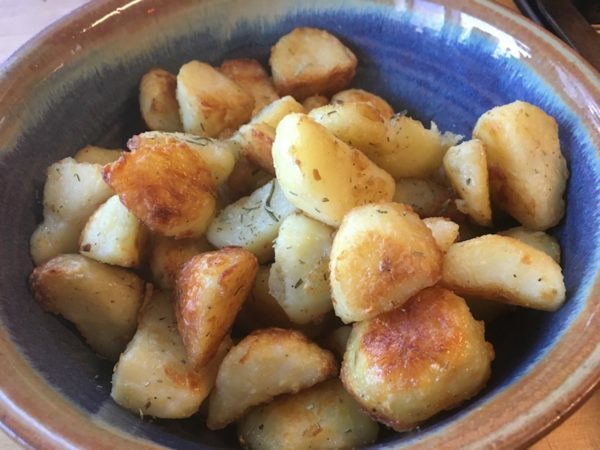 The title: The Best Roast Potatoes Ever. As soon as I watched it, I knew I had to give the recipe a try. 2. Boil 2 quarts of water — recipe calls for an ounce of salt, which is roughly 5 tsp (I didn’t add that much), and a 1/2 tsp baking soda. The baking soda helps makes a crunchier crust. 3.Add potatoes to the boiling water. The recipe says parboiling before roasting makes moisture escape faster, which leads to a thicker crust. 4. Boil for about 10 minutes. 6. 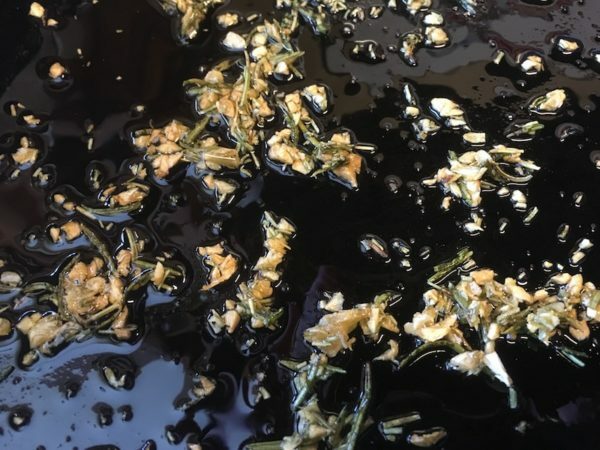 Strain the flavored oil mixture into a large bowl. Set aside the rosemary and garlic. 7. Drain the cooked potatoes and let them steam a bit to drive off extra moisture. 8. Preheat oven to 450°. 9. Add the potatoes to the bowl of oil. 10. Season a bit more with salt and pepper. 11. Roughen up the potatoes by tossing them in the bowl. It creates sort of a mashed potato layer on the outside of each chunk. 12. Spread the potatoes onto a baking sheet, keeping a little space between each chunk. 13. Roast potatoes for about 20 minutes, then carefully flip with a spatula or turn each one over by hand. 14. Keep roasting and flipping (patience may be required) for about 30 to 40 minutes or until well browned and crisp all over. 15. Pour the potatoes into a bowl and toss with strained garlic and rosemary and some freshly chopped parsley. What a treat, and one that kept on giving. The recipe made so much, even after a dinner for two, I had enough leftovers for two lunches for me. Just as promised, they were crispy and crunchy but tender on the inside. (Like some people we love!) And they got better and better with each meal. 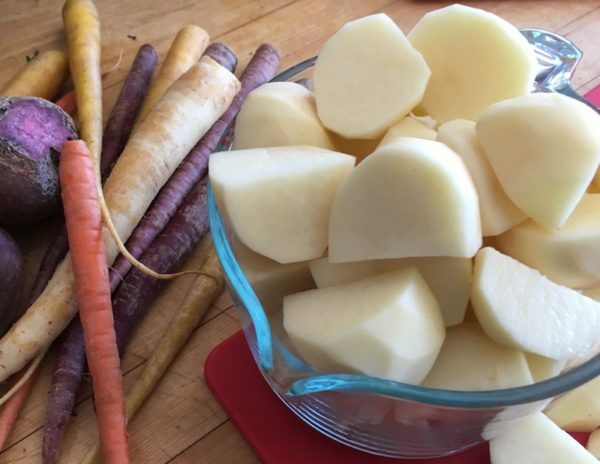 If you want to learn more about the science behind these delicious potatoes, get the step-by-step from Serious Eats. And be sure to check out all the other great recipes we have here on Catching Health.